Surprisingly compact at 1100mAh, the 2200mAh Joyetech Ego One isn’t much larger than it’s smaller sibling and includes twice the capacity and a larger 2.5ml (adjustable airflow) tank. What sets both versions of the Ego One apart is that they’re compatible with two types of replaceable heads that cater to different types of users; traditional mouth inhale (1.0 ohm), or direct lung inhale (sub-ohm – 0.5 ohm). 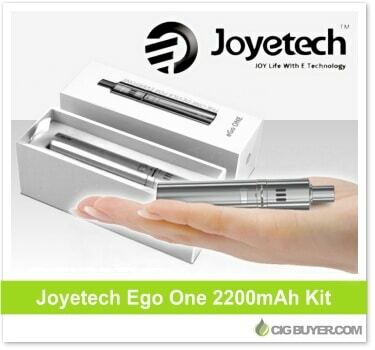 The Joyetech Ego one is compact, affordable and designed for every type of vaper – both beginners and advanced.